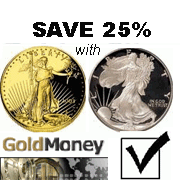 "Gold & Silver Accepted Here"
The secret to small businesses' successful hedging against dollar decay lies within easy grasp, it's free, costs little time, and literally has no downside: accept on-and offline gold and silver payments alongside dollars. The fact that euros are accepted by many stores in New York City has made the news lately and is well known in gold investor circles. It is yet another symptom of the ongoing demise of the US dollar. The good news for these New York City merchants - and for all others nationwide - is that gold and silver will not be far behind and offer far better advantages as dollar-alternatives. You may think that honest-to-goodness currency demand for gold and silver is non-existent in the US and that this will remain so until the legal tender laws are repealed (as currently proposed by Representative Ron Paul’s dual HR 42756 and HR 4683 approach) - but that is not necessarily true. Such demand will soon begin to build, regardless of Ron Paul's efforts in Congress - and it will take off very fast. Until now, merchants or service providers labored under the quite incorrect assumption that offering their goods for gold and silver would be unprofitable, and a waste of time because of a number of factors. Insufficient numbers of consumers own spendable gold or silver or are aware of their availability.. Yet, none of these reasons really prevent merchants from profitably offering their wares for gold. (Whenever the word "gold" is used from here on forward, it should be understood to include silver). The dollar's rapid decline and the accompanying credit crunch and world economic slowdown are changing the picture for gold-as-currency dramatically. Gold has always been - and will always be "money", but its actual widespread use as a circulating medium of exchange has been stifled by the above listed factors. Let's go through them, one by one, to see if they really pose such severe obstacles to the use of gold as a viable currency. The applicability of Gresham's law (that "bad" money always drives "good" money out of circulation) really depends on the inconsistency between the face value and the actual bullion value of a coin (in the case of a gold coin standard), or the overprinting of paper receipts for gold (under a classical gold standard). Neither condition exists today. What we have today is a universal "fiat standard", if you will. The question to be examined is whether Gresham's law really dictates that fiat (bad money) will always drive out or prevent the widespread circulation of good money (gold). In truth, when (not "if") gold becomes more widely used, it will have a tendency to drive out bad money in our current set-up. This will be achieved largely by merchants' offering significant gold discounts for their goods. The main reason nobody buys with gold is that it is hard to see why purchasing an item for gold will be a benefit to the buyer. In a rising gold/declining dollar environment, merchants can easily afford to offer tremendous savings to their customers by deep-discounting their goods for gold-paying customers. Whatever revenue "loss" may accrue to them at the time of the purchase will be made up in the future by the dollar-price appreciation of the gold earned over time. Further, by offering his customers such tremendous discounts, he makes them very interested in acquiring gold so they can take advantage of his offers. That, in turn, drives up demand for gold, which ends up supporting and further boosting its dollar-price increases - all to the benefit of both the merchant and the customer. In the end, Gresham's law is turned on its head. By merchants offering deep discounts, the tendency to hoard the gold is either lessened or eliminated altogether. This factor is eliminated almost automatically, and passively, by simply offering the discounts to gold-customers in the first place. People already get excited and start buying loads of stuff during so-called "tax holidays" offered by some states on certain days when certain products are exempted from their sales tax. Sales taxes are usually under ten percent. Imagine what a continuous "price holiday" of, say, 25 percent is offered. Customers will likely fall all over themselves to be able take advantage of that. This way, without having to try and "educate" your customers about the ins and outs of Austrian economics, you - the merchant - give them a reason to educate themselves, and even if they continue in their completely ignorant bliss, they still understand that a "quarter off" is a good deal. That's all they need to know. If they want to know more, you can point them to an online FAQ page on your company's website. "Whoever, except as authorized by law, makes or utters or passes, or attempts to utter or pass, any coins of gold or silver or other metal, or alloys of metals, intended for use as current money, whether in the resemblance of coins of the United States or of foreign countries, or of original design, shall be fined under this title (!1) or imprisoned not more than five years, or both. Obviously, American Eagle bullion coins, declared by law to be legal tender, are excepted from the application of this statute. Only coins of "original design" or those resembling coins of foreign countries, if passed as current money, are covered. That leaves paper bills (which we are not addressing here) and digital gold currencies - so we're clear of any legal challenges to the use of digital gold or American Eagles coins in day-to-day commerce within the United States. Ordinarily, appreciation in the dollar-price of gold bullion is taxed at applicable capital gains rates. In the case of certain online digital precious metals currencies, however, this rule may not apply. It may well be the case that such currencies are given the same tax treatment as other physical, nationally issued currencies of foreign countries, which means in effect that any gains or losses stemmming from fluctuations of the dollar against such currencies are treated as ordinary income gains or losses and are taxed as such. Goldmoney, Pecunix, and eBullion are examples of digital PM currencies that may fall into this category because their official seats or registered offices are located offshore. E-gold, on the other hand, would be an example of a currency that would not be treated as 'foreign' since its registered office is located within the United States. It is noteworthy here that Title 26, USC Section 988(e)(2) appears to provide for a $200 exclusion of gains accruing to individuals from transactions in foreign currencies. The American public is largely ignorant of the possibility and advantages of not only accumulating, but also spending gold as currency. Because of that, very few Americans own spendable gold. That problem is easy to fix, though. The only real challenge will be to get enough merchants and service providers to get on board and start to accept gold in payment for their products and services. As already discussed, the mere fact that such huge discounts are offered on some or all products a merchant sells will make customers curious. Very curious. A small hand-out brochure that explains just the most important facts about gold and its use as a store of wealth and currency in a falling fiat-dollar environment will go a long way toward educating Americans. Without people first having a reason to be interested in gold, all efforts at educating the public will be in vain. To be effective, that reason can't be a purely theoretical one, though. Don't even try to convince people that gold keeps inflation at bay, etc. They just don't care. But give them a solid discount, and you'll be surprised haw fast they will learn the truth about inflation. The best thing is, this takes very little effort on the merchant's part. Once they are curious, just hand'em a brochure. That's all. What If the Gold Price Drops? If gold should drop again for any extended period, customers will still be attracted by the discounts. As long as they get their discounts, they'll still like the idea of buying gold and paying with gold. A falling gold price actually makes the idea of buying gold and paying with it to get the discount even more attractive because your customer now pays less for each additional unit of gold he buys. The only thing that changes now is the benefit to the merchant. The discount, expressed in dollar terms, now increases the gold-proceeds he gains from the transaction. Who wants to complain about that? A. The customer can go to his online gold account and use new fiat units to buy the gold he needs for the product. In that case he will exchange $75 in FRNs for gold grams. The customer will incur whatever exchange fee is charged by the digital gold currency (DGC) issuer, which will decrease the value of the discount to him. But because of the declining dollar-gold price, his $75 now buy more gold. You, the merchant, therefore end up with more gold! B. If the customer decides to use previously exchanged, pre-existing gold-units from his account, he will of course incur no additional exchange fee. Yet, in a declining gold price environment, his previously acquired gold unit will have cost him more at the time he acquired it, so he loses there. He'll therefore need to calculate which “loss” is greater and proceed accordingly. It is important here to remember that any 'loss' we are talking about here is only a minor reduction in the overall benefit of the discount to the customer, so the discount will still produce a net benefit to him, regardless. Also, the additional effort and inconvenience of having to make the above calculation is really no greater than maybe shopping with grocery store coupons. Considering how many people voluntarily undergo the routines associated with shopping with coupons, the price incentive we are talking about here is obviously greater than any adverse consideration of this sort. Try getting even anywhere near to an overall 25% savings out of supermarket coupons. Good luck! What Happens During Gold Price Rises? During times of gold price increases, the customer's conversion of new dollars into gold yields him less gold at each successive point in time than it did at the previously lower price. He can then use previously acquired gold from his gold account, rather than exchange new fiat-units at the now higher price. That saves him the exchange fees and allows him to avoid the now higher cost of gold. So he goes to his account, calculates the gold gram value of the 75 dollars as of the time of the purchase (in the case of GoldMoney easily done with its online gold gram calculator), and transfers the gold to the seller's account. No problem. Since seventy five bucks now buy less gold, the merchant ends up with a little less gold than he would in a declining gold price environment. But he still gets the benefit of having earned stable and reliable, over time rising gold rather than fast declining fiat dollar units. The merchant effortlessly and without out-of pocket cost accumulates a nice base of stable gold currency that he can either take delivery of in the form of bullion or exchange back into fiat units at any time he chooses. He also ends up with a growing customer base of people who own gold, who can therefore pay him in gold, and who enjoy the resulting financial security and insulation from a total currency collapse that looms in the case of the dollar. At any time of catastrophic currency collapse, both merchant and customer are protected, and the merchant has the added protection of having developed a customer base made up of people who can still buy things from him, regardless of how badly the dollar "bombs." There already is a Silver & Gold Payment Calculator set up by Catherine Austin-Fitts of Solari and Franklin Sanders of The Moneychanger. It allows anyone to calculate any change to be given a customer who pays with American Eagles or any other country's gold or silver coins. On top of all this, merchants can take advantage of referral programs offered by several digital gold currency providers. That means a merchant could purchase gold by going to the Small Business Goldmine referral link when buying gold for his own account. (Note: the DGC issuers we deal with do not have a multi-tier referral structure at this time.) He would lose no money thereby, since the price of gold grams remains the same, regardless of whether he buys directly or through the referral link. He could then point his customers (or even his vendors) to his own referral link for their gold buying and steadily earn commissions, several levels down, completely passively and without any additional effort - apart from his already existing discount pricing for gold-paying customers and the informational material he provides them. This will vastly multiply the use of gold and silver in day-to-day e-commerce transactions and create a significant additional level of support under gold and silver’s fiat-currency price. Of course, the same process can be duplicated in other countries, depending on their laws. That way, the world can go a long way toward transitioning to the use of gold and silver as a full-fledged parallel currency. This will happen in spite of the IMF and the world’s system of central banks and big financial houses who exercise centralized control over markets and governments alike - and you, the long-time gold investor, will be very well off. If we all work together, great days will be ahead for precious metals investors, free market advocates, friends of liberty, supporters of the rule of law, and business owners of every kind and their customers. Just like driving your car, investing only makes sense if you can see where you are going. The Euro vs Dollar Monitor is your golden windshield wiper that removes the media's greasy film of financial misinformation from your investment outlook. Don't drive your investment vehicle without it! To stay up-to-date on important developments, sign up for our RSS Blog. It's FREE - and there are no email delivery problems! The Small Business Goldmine is the Internet's only one-stop resource for businesses that want to "go gold". Whatever you need to accomplish that purpose, you will find it here. If there is something you need but cannot find, email us and we will put it up. Nothing in this essay or in any writings published on or through the "Small Business Goldmine" shall be construed to be legal advice, and such publication shall not be deemed or construed to create an attorney-client relationship of any kind. Further, no principal of the Small Business is an attorney licensed to practice law in any state of the United States or any foreign country, nor is any such principal a licensed investment broker or financial advisor. All statements contained herein are strictly the considered opinions of the author(s) and are published for informative and/or educational purposes only. As such, they are not to be construed as constituting "financial advice" of any sort, and reliance on same is hereby expressly disclaimed and discouraged. Readers or users of the Small Business Goldmine or of any articles, essays, opinions, or analyses published thereon or reprinted alsewhere are expressly cationed to do their own research to verify any information contained herein. Reliance on any informational material published herein is not legally justified and, by accessing such information, user expressly agrees not to use claims of such reliance, if any, as the basis, in whole or in part, of any legal claim that may be asserted by, through, or under such user in the future.